CHARLOTTE, N.C. (AP) — Eric Reid isn’t planning on giving up his fight against racial injustice in America or his battle with the NFL. He just doesn’t know if his protests against injustice will include kneeling for the national anthem . Reid, who signed a one-year contract last week with Carolina, said Monday he is “still considering other ways” to protest and continue to raise awareness. 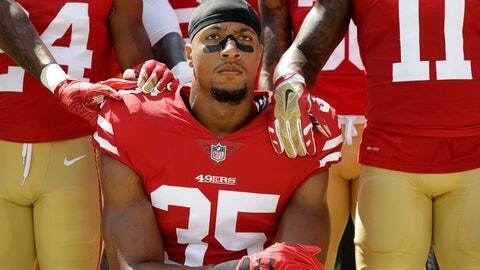 The former Pro Bowl safety did not elaborate on his plans, but did say he will not drop his grievance against the NFL that alleges teams colluded to keep him out of the league because he protested alongside Colin Kaepernick. Reid said the Panthers didn’t ask him about his protest plans until after he signed. Reid said he was surprised when the Panthers called last week, saying he thought it would take much longer to get a second chance at the NFL. He said the San Francisco 49ers also offered him a chance to play last week, but that the Panthers’ offer was better. Reid returned to the field Monday for the first time since Dec. 31, 2017, when he finished the season with the San Francisco 49ers before becoming a free agent. Despite starting 69 games in the NFL, Reid didn’t receive any attention in free agency and filed a grievance in May alleging collusion by NFL teams for not signing him because of his decision to protest racial injustice during the national anthem. He is expected to start on Sunday against the New York Giants. Reid knows he will continue to face opposition by standing up to racial injustice, not unlike what he and Kaepernick experienced here in Charlotte while playing against the Panthers on Sept. 18, 2016. At that time some fans seated in the lower bowl of the stadium gave Reid and Kaepernick a hard time about their protests — similar to what he heard in other stadiums around the country. That game in 2016 came two days before a black man, Keith Scott, was shot by police in Charlotte, setting off nearly a week of protesting that shut down the city and caused the National Guard to be sent in to help restore order.